History of Honey - Why You Can Help Save It! Why You Can Help Save It! A short primer on the history of honey and why you can help to save it! The oldest Honey bee specimen that exists today is said to have been over 45 million years old. It is incased in petrified amber and nearly unchanged from how it looks today. What this means is that the honeybee could exist as far as 200 million years. If that is the case, then honey bee is one of the few remaining creatures that actually lived in the time of the dinosaur! Without the honey bee, we too would die off. Without crop pollination, the animals we eat, the fruit and vegetables we consume and the trees we get our oxygen from would all disappear. There were some great changes and new equipment that came into use during the mid-19th century. Prior to 1851 the method of collecting honey from commercial hives involved the total destruction of the structure of the honey combs. Honey history took a big turn in 1851; this is the year that Lorenzo Lorraine Langstroth made the key discovery that the use of suspended movable frames containing bee’s wax enclosed in a case could not only stop the destruction of the entire honey bee’s work but increase the honey yield. In 1857 this new system of Langstroth’s was improved upon even further by the production of the first man made honey comb matrix by Johannes Mehring. This allowed for the commercial production of sheets of wax foundation to be made and used in the suspended frames, thus cutting down on the necessary work of the honey bees themselves. 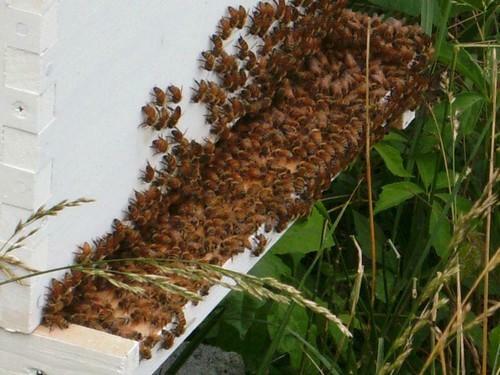 Once again increasing honey production yields. In 1865 Franz von Hruschka of Austria; produced the first honey extractor that used centrifugal force, which is still the method used today. The next large changes in the bee keeping industry occurred after World War II with the expansion of the air transportation industry. It was now feasible to move colonies of bees across countries and even continents. Unfortunately this new change brought unseen dangers to the honey bees. Diseases and parasitic mites sometimes went with the bees to and from their new locations. Recent studies have been conducted worldwide to save the honey bees from mites and diseases that jeopardize their survival. Ecologically safe methods of pests control are being developed to replace conventional methods. By improving agricultural practices, we can increase the available amount of forage for honey bee. Saving bee habitat is as important as developing new methods of beekeeping. I know that not everyone is in a position to raise honey bees in their yards. But that is not the only way you can help. Each one of us can make decisions in our lives that can produce a positive chain effect. This can be as easy as using caution as to what chemicals you use around your home to control insects and weeds. Planting flowering trees and bushes that provide the honey bees with an ample nectar supply is also a good way you can help. The honey bee has survived through centuries – it is up to us to assure its continuation. Your food supply depends on it!